Justin Gaethje has made it perfectly clear that he wants to fight UFC lightweight champion Conor McGregor. The problem is, everyone else in the lightweight division wants a piece of McGregor. 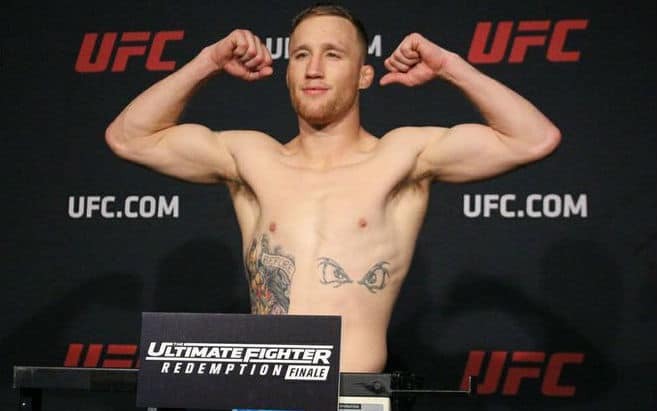 However, unlike the other fighters who want a piece of McGregor, Gaethje has a plan for making the fight happen. Gaethje’s plan is to score a vicious knockout of Eddie Alvarez at The Ultimate Fighter 26 Finale on Dec. 1. If he can be able to do that then he believes it will get McGregor’s attention. For those who might not know, Gaethje and Alvarez are coaching opposite one another on this season of TUF, which has already premiered on FOX Sports 1. The latest season of the reality show will crown the UFC’s first women’s flyweight champion. “McGregor, when he comes back, he’s gonna pick whoever he wants,” Gaethje said Wednesday at a media lunch in Century City (transcript courtesy of MMA Fighting). “As the competitor that I see him being, he’s gonna want the most dangerous guy. When I finish Eddie Alvarez quickly, that’s gonna be me. It’s believed that if or when McGregor returns to the UFC, he will fight the interim champion upon his return. That will either be Tony Ferguson or Kevin Lee, who fight for that belt in the main event of UFC 216 on Oct. 7 in Las Vegas.